Put your 8 week old puppy in your lap and give him a not too big item to take in it's mouth. When the puppy grabs the item prase him and tell him "good fetch". Change item as the puppy gets older . This is to get him used to different materials and shapes. Always praise your puppy with a calm voice and gently stroke his chin. Carefully remove the item from your puppys mouth and then return it again. Sometimes you can end the trainingsession at this point and other times repete the procedure once or twice before ending the session. As the puppy gets more skilled you can have him to sit while you place an item on the floor in front of him. Now, as you tell him "fetch" you'll get to know if you've succeded in your training. When the puppy grasps the item calmly call him to you. When he returns with an item don't be to quick to take it from him. Calmly praise him and stroke his chin before removing the item from his mouth. Remember! Trainingsessions should be short and not occur too oftern, or your puppy will soon loose his interest. 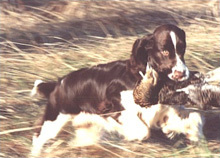 When the puppy fetches the item and returns to you without a fuss it's time to take your training outdoors. 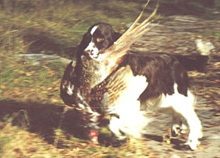 Never bait your Springer to struggle or rush him by throwing balls.